"In recognition of his managerial courage, extensive industry knowledge and independent thinking in the successful restructuring of several steel companies to international competitiveness." Thomas C. Graham is Chairman and Chief Executive Office of AK Steel Corporation, a new company which emerged from the former Armco Steel Company, LP. Mr. Graham began his career in 1947 as a draftsman for the former Jones & Laughlin Steel Corp to which he was named President and Chief Executive Office in 1975. Also in 1975 he was appointed Group Vice President and a member of the board of The LTV Corporation which had purchased J&L. In 1983 Mr. Graham joined US Steel as Vice Chairman and Chief Operating Office, Steel and Related Resources and in 1990 he was named Chairman of the steel and diversified group of USX, a position he held until he retired. He was then hired as Chairman and CEO of Washington Steel Corp. which was in bankruptcy; he led the successful turnaround of the company and its sale to Lukens, Inc. In 1992 he joined Armco Steel as President and CEO. 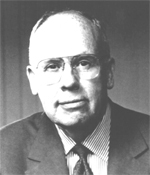 Mr. Graham served as Chairman of the American Iron & Steel Institute from 1986 to 1989. He is credited with leading AISI in various steel research and development. marketing and government affairs initiatives. He is one of three principal investigators of a study of the competitiveness of the American steel industry funded primarily by the Sloan Foundation. He is currently a director of International Paper Company and Hershey Foods Corporation.